BBC Journalist Rana Rahimpour, a British and Iranian dual citizen, after being denied entry to the U.S. earlier this week. Even as the end of strict sanctions represents a step forward for U.S.-Iranian relations this week, new visa restrictions recently passed by Congress are starting to take effect, causing many Americans with dual citizenship with Iran, Iraq, Syria, and Sudan to feel like second class citizens. These restrictions were passed in the House last December with broad bipartisan support and little public discussion. Even as Donald Trump’s fantasy of banning all Muslim immigration to the U.S. has been widely discussed--and universally criticized--a real law has been enacted that's causing serious hindrances to a large number of American citizens, including many Muslims. The law in question is H.R. 158, the “Visa Waiver Program Improvement and Terrorist Travel Prevention Act of 2015.” The law cancels the current Visa Waiver program that allows citizens of 38 nations to visit the United States without a visa if those citizens either have dual citizenship with any “country designated as one that has repeatedly provided support for acts of international terrorism,” or if an individual has visited one of those countries since March 2011. The intent of the law, which was passed immediately in the wake of the Paris and San Bernardino attacks last fall, is evidently to try and make it more difficult for American citizens who may have trained with organizations like ISIS while visiting these nations to return to the U.S. and wreak havoc here. Given the timing and the focus on ISIS, the inclusion of Iran in particular on the list of nations to which the new law applies is puzzling, as ISIS is very much a Sunni organization (and therefore totally absent from Iran), and none of the attackers in any recent international incident have been Iranian. Indeed, some have speculated that the Republican-controlled Congress included Iran and Iranian Americans on this list specifically to embarrass President Obama at the very moment when sanctions on Iran were about to be lifted. Laws passed by Congress in the heat of the moment -- think the Patriot Act -- often end up being bad laws, and this one is no exception. H.R. 158 adds a new area of bureaucracy and an array of travel restrictions that the more than half-million American citizens of Iranian descent are calling discriminatory. It also does precious little to actually help fight the threat of Paris or San Bernardino-style attacks. Tashfeen Malik had been radicalized in Saudi Arabia, not Iran, Iraq, or Syria; her husband, Syed Farouk, had been raised in the U.S. and had only visited Pakistan. (Neither of those countries are on the list of nations affected by the new restrictions). The law also has some odd side effects. For one thing, the American Visa Waiver program operates on a principle of reciprocity with the 38 countries that are party to it. These include many European union countries as well as Taiwan, Japan, and South Korea. That reciprocity is positively- as well as negatively- reinforcing. 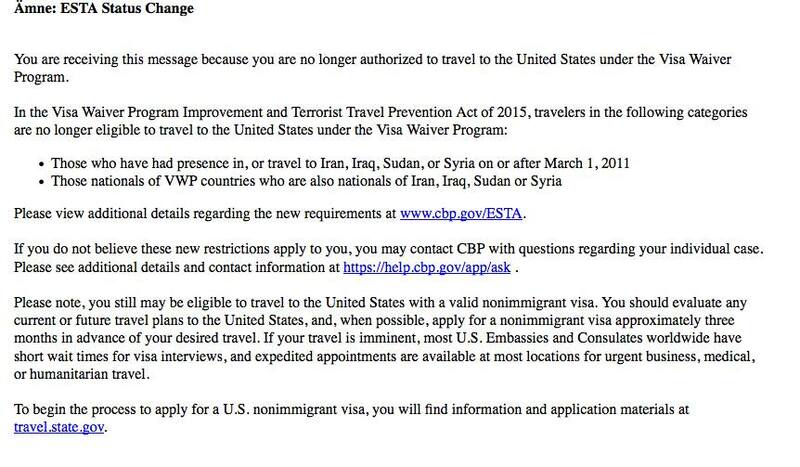 So if the U.S. no longer accepts a certain class of dual citizens (say British subjects who were born in Iran) via visa waiver, that same class of dual citizens will now need visas and embassy interviews to travel to those countries as well. 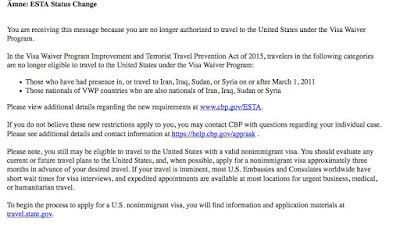 Thus if anticipated reciprocity takes effect, Iranian-Americans and others may soon need visas to visit many countries that previously would have allowed them to enter simply based on the fact of their possessing an American passport. It should also be mentioned that Iran considers people who were born there or who are descended from Iranians to remain citizens even if they become citizens of another country. This is true even if they exclusively travel on an American passport and give up their Iranian passports. So Iranian Americans who hold U.S. passports and have not visited Iran since the days of the Shah may very soon find that they need a visa to go to London, Paris, or Seoul. There is at present quite a bit of confusion regarding when and how H.R. 158 will be applied. BBC journalist Rana Rahimpour, a dual British and Iranian citizen, learned this the hard way this week when she was denied entry to the U.S. Rahimpour had been on her way to visit family and celebrate the birthday of a nephew, as the Guardian has reported. Rahimpour has worked for the BBC Persian service, but has not visited Iran for many years (ironically, because Iranian officials frequently harass BBC journalists). 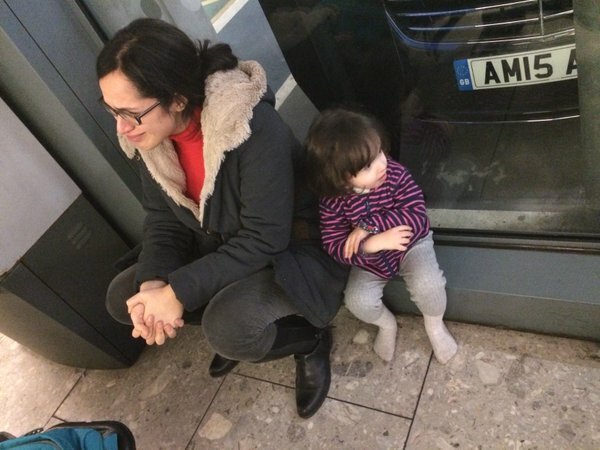 On January 19, she Tweeted, “Three days after lifting Iran sanctions, US denied ESTA/visa waivers for me and another two British citizens because we have Iranian nationality too.” In addition to live-Tweeting the denial of her visa, Rahimpour posted an image of herself and her daughter in tears at Heathrow airport. The State Department’s web site does not clarify matters, as it only announces that the program will begin to roll out soon. It does not give details as to who exactly is affected and what steps they might need to take to get around potential travel restrictions. The expectation is that the bill will go into effect on April 1, 2016, but Rahimpour’s experience suggests that the implementation of the law has already begun. Iranian American groups have begun mobilizing to raise awareness about the unfairness of H.R. 158. Links to the recent Guardian story about Rana Rahimpour are generating a lot of social media uptake, and Facebook groups like “See You in Iran” and “Stop HR 158” have been created. Most critics agreed that Trump’s proposal to ban all Muslim immigration would be both unconstitutional and totally ineffective (indeed, it lends fuel to Jihadist organizations, who use the recent history of the American abuse of Muslims to recruit new volunteers). H.R. 158, which is apparently already in effect, is likely to equally ineffective, and raises troubling questions about lawmakers’ failure to treat American citizens fairly -- or to think through the potential fallout from laws designed, even perhaps with “good intentions,” to combat terrorism.